I’ve been doing some research into the coverage of the Gaza conflict (back end of 2008, front end of 2009) on blogs. 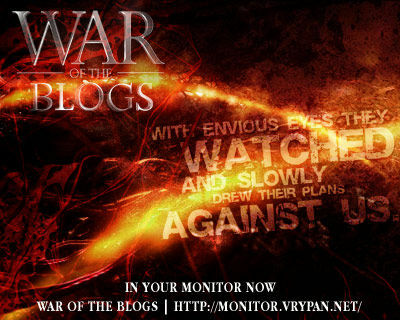 One of the English-language blogs that covered the war was the Muqata blog. The Muqata blog was started in 2005 by ‘Jameel’, a Jewish settler who had lived in Chomesh in Gaza before the Israeli withdrawal. The blogger says his aim was to promote ‘aliya’ or ascension to Israel by promoting the ‘love of Israel, the land of Israel, and aspiration of living in Israel to the JBlogosphere’. Jameel’s friends assisted with blog postings. During the Gaza crisis the blog provided dozens of rolling time-stamped updates on the conflict aggregating information from a variety of sources. There was much discussion at the time about the nature of the media or information war which was running alongside and indeed as part of the Gaza conflict. "We’re doing our part, to help with the war on the information front, while the [Israeli Defence Force] IDF does it’s (sic) job in Gaza." "With news sites around the world taking the Gaza side, with pro-Gaza demonstrations going on everywhere, we need to be as forceful as possible in our media reporting on behalf of Israel. "Our soldiers in Gaza do not need to be stabbed in the back by IDF radio — they need our full and total support, and not hearing interviews with the head of the Shifa hospital, which is housing munitions, rockets, and where Hamas terrorists are dressing up as doctors and nurses." Not only, then, were the Muqata authors taking up the blog as a digital weapon in a media war against a perceived enemy, they were also calling out those they regarded as information traitors from within their own ranks. General Rupert Smith’s observation that war is now fought amongst the people ‘in every living room in the world’ appears even more prescient given the way individuals are actively deploying digital technologies to participate in media wars. And if the media, in the broadest sense of the term, is adjudged to have a central role to play then the distinction between civilian and combatant is becoming increasingly blurred. Photo: Vrypan, Flickr, Creative Commons.